Plus, Drew Logan explains how he maintains focus in a distracting world. Drew Logan: My day starts very early! I wake up at 3:50 a.m., dress in the workout clothes I have laid out the night before, drink exactly 20oz water… and I am out of the house and doing a “walking meditation” by 4 a.m.! This is a 1-hour power walk alone without any kind of headphones or distraction. I focus intensely on creating a rhythm between my steps and my breathing – the idea is to create big inhale through the nose and a long and powerful exhale through the mouth. This movement goes on for an hour and I prepare my mind for the day ahead. It increases circulation, increases lymph flow, increases brain chemical function, and makes sure I start the day in a caloric deficit so I am utilizing fat as energy. I have already prepared my breakfast the night before (6 egg whites, 2 yolks scrambled with ground bison, spinach, and tomato. 1/2 grapefruit on the side). I pop this in the toaster oven for 10 mins at 350 while I get ready. I am eating precisely at 5:15 a.m., and I am finished and in my truck by 5:30 a.m. on the way to the gym for strength training from 6 a.m.-7:15 a.m. I am back home by 8 a.m. Eat, showered, and ready to begin my day by 9 a.m.
DL: What gives me the most energy (physically) is staying in my daily routine. It is extremely productive and allows me to accomplish more in a day than most people accomplish in 2-3 days. What gives me the most energy (mentally and emotionally) is creating! I love the process of building or creating something. My first book 25 Days is about to launch on Sept 12 and it was a bucket list item for over 12 years! I focused relentlessly for years on creating the program and idea for my book and when the opportunity to present that ideaI I couldn’t sleep the night before because I was so stoked to let that idea out into the world! After that process was done and the deal was signed, I loved the entire process of creating my book, the ideas, the possibilities, and I am even loving the process of getting it out there and publicizing and marketing it! I have multiple other projects in fitness, TV, and business and staying “In the game” keeps me fired up, excited, and keeps my mind razor sharp and focused! Creating is living! DL: I have 5 simple life hacks that are life changers! I have used them extensively myself for decades and every time I have taught them to another person, (and they’ve implemented them) their lives have exploded as well! Hack 1 – I walk every morning on an empty stomach, in silence, for 60 mins. The only thing I hear is my focus on breathing, the sound of the rhythm of my feet on the pavement. Hack 2 – Every Sunday, I write down the 3 Major, 5 Minor, and 7 Busy goals I have to accomplish for the coming week. I include days they have to be done, the time they need to be done, and what the net result needs to be. I keep these in a notebook together and look back at them to see how they are propelling me forward and are tied to my success! Hack 3 – I train with a goal in mind, physically. There is a significant difference between exercise and training – training is a process of getting ready to perform and it is vital to stoking the brains reward center and the dopamine response needed to elevate performance and focus! I don’t always have the same goal. Sometimes it is a race, sometimes it is learning how to be a proficient swimmer, sometimes it is strength based, sometimes it is to look in the best shape of my life on vacation. But always I have a goal that is 1.) Measurable 2.) Definable 3.) Dated and 4.) Slightly outside my comfort zone! Hack 5 – I disconnect from the world! I always take time off every 90 days. Sometimes it is just for 4-5 days a couple hours outside of LA that may overlap a weekend, and sometimes it might be 10 days on a remote island off the coast of Fiji with no contact with the outside world. No matter what, I make the time to completely decompress and try to eliminate any stimulus or grand entertainment. The hardest thing to do, is to get quiet with your thoughts and really think – and it is the thing I value most. When I can stop the outside influence I can really feel and think clearly and come up with the best strategies for my life. Sometimes, I may just “disappear” for 2 days in my own town and check into a hotel – this is great way to get away without leaving and sometimes feels like a break enough to just reset my resolve to tackle the upcoming week! DL: I love reading! And I have always kept a small “success library” that I refer to and read often. Most of the book I have, I have read them through multiple times, and I use them as reference guides. I highlight in them, I make notes in the margins, I also have a notebook that I keep with me when I am reading that I use to write down ideas, or thoughts that are inspired by the books I am reading. Some of the best ideas I have ever had were inspired by reading something that triggered a thought that sent me on an adventure in my head of creating something I am passionate about! For me one of the first books that changed my life, I found in the mid 1990’s – it was small, concise, short, and I read the whole thing in a day. It was called, Notes From A Friend, and it was by this author I had never heard of before. He was on the cover with this really bad fake tan, and wearing a denim shirt, but the book was endorsed by Arnold Schwarzenegger so I thought I would give it a shot! But that book literally got me thinking differently than I ever had before and shook up my mind! I was stoked that somebody thought as crazy as I did – or maybe I was excited that I wasn’t crazy – or that I had found someone who was also a crazy thinker in terms of having a fulfilling and big life! At any rate, I bet I have read Notes from A Friend 20 times and taken my own notes, suggested it to a dozen friends, and it has spawned countless ideas and businesses I have started. It made me ask questions and take quick easy steps to determine what I wanted in my life and where I saw myself going. I still value it highly and suggest it to friends that are “looking for answers” to change their life. The second book was I Feel Great and You Will Too by Pat Croce. The energy, passion, authenticity, and time management skills of Pat totally resonated with me and I found myself inspired to live unapologetically passionate and “real”! These 2 books have stayed part of my library and get circulation and reference use on a regular basis. I highly encourage you to read both of these as well as anything by both of these guys! You will thank me for this! DL: I have a pretty good relationship with my phone. I am not constantly on it, but it is a great tool that I utilize. 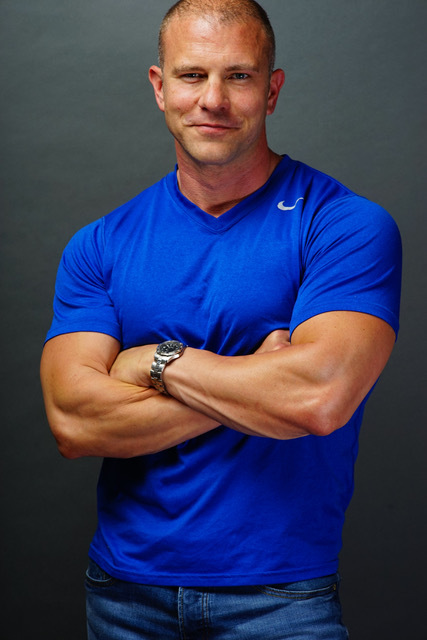 I shoot a lot of videos for use on social media and to create quick explanations on exercises or ideas to share with followers – I am huge on the dissemination of information and I try to be a voice of straight forward no nonsense advice in the area of changing your body, changing your mind, and changing your life. And I turn my phone off at night. I have my parents and brothers set as the only emergency numbers that can bypass the “nighttime” function. As I mentioned above, I sleep only about 6 hours a night (by design) so it is important that I have no distractions and that those quick hours are very productive deep and healthy hours. DL: As you may imagine, all of my time is scheduled down to the 15 minute time interval. My sleep, my workouts, my meals, my time for relaxing, my time with my dogs, to read, to play my guitar…everything. So I schedule time specifically to answer emails on a daily basis. I do not get email notifications on my phone, because I want to answer them when I am sitting at my desk and focused on that task. I always try to answer emails and voicemails within the same day they are received, but always within 24 hours of receiving them. DL: This doesn’t usually happen. However, sometimes people have to change plans or cancel plans due to various reasons and I find myself with a hiccup in the middle of the day that I didn’t expect. In the event that I find “free time”, I may use it in a myriad of different ways depending on how much time it affords me – if it IS only 15 minutes, then I may take my dogs for a quick walk to the park and back, or plug in my electric guitar and annoy my neighbors by jamming out to some tune that I love, or call my parents or other friends and family that I want to to catch up with and just get the chance to tell them ‘I love you’. Should the time be longer? Then I try to see what on my remaining schedule I have for that day that I can move up – this can help me free up evening time to spend with friends or loved ones that I wouldn’t typically get to do – or to get a chance to go to a movie! DL: Burn out comes from imbalance. I rarely get to this point if I am scheduling and eating properly, staying in my routine, and keep ing my head “In the game”. However, I recently got burnt out because I avoided one of my essential life hacks and I didn’t take time off like I was supposed to. I was helping someone with a rapidly growing medical practice, reorganize, strategize, and organize their business for sustainable growth without overtaking their life. We did a 90 percent re-staffing and total strategy restructure in 6 months! We accomplished what we set out, but at the expense of my hard-line rule. So at the end of the 6 months, I went to Fiji for 10 days and decompressed! Lesson learned…again! DL: I like this question. In fact, the very structure of the question explains what is most wrong with the way we view success and failure. “…you felt you failed…” The truth is, I rarely every feel like I have failed! My biggest fear in life is that I do not do something that I think I should or is a good idea. So in that sense, the only way that I experience the feelings of failure, is to not try! And anyone that knows me, knows that consistently trying, remaining eternally optimistic, and never ever stop getting back up when you’ve been knocked down are some of the core beliefs and values of my life! And if I can answer yes, yes, and no…then I immediately follow it with the statement, “…if not this, then something better!” then I let it go! The only time you ever fail is when you fail to try! Ask for the sale, the promotion, the help, ask out your dream date, move to a city you love, take the vacation of your dreams, no matter what you have to find a way and do it now! If you follow this process and live your life this way, you will rarely (if ever) experience the “feelings of failure”. DL: I have a lot of quotes that I use. Some of them funny analogies that I used to hear my dad say a lot – these are usually very plain and blunt logical statements that have a comedic but straightforward message that make you laugh, and take a pragmatic approach to your problems or questions. I love the way it will make me laugh and break the serious of the situation and engages the part of your brain that says, “Hey this isn’t a life or death situation, so don’t something rash!” It tends to make you slow down and think a little deeper about your actions or ideas.